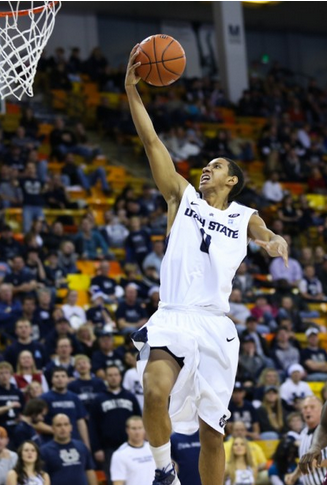 Entries about current Utah State Basketball players. It’s that time of year again! Time to try and piece together the team for the upcoming basketball season! We’ve done just that at USUStats.com with our annual “Pictorial Roster“. Check it out by clicking below, and feel free to post questions, comments, or predictions on any of the players you see on the roster. Also feel free to reminisce and check out the rosters from past seasons by changing the season in the drop down box at the top of the page (once you click the link above). Marcel Davis – This kid is the real deal. One of the big recruits we’ve had in recent years, and he has lived up to the hype in my book. A genuinely nice kid (one of the nicest players I’ve had the privilege of meeting and talking to on campus), an extremely hard worker (saw him with the shooting machine twice while I was on campus in the summer), and a relentless competitor. It has been great to see him blossom over the course of this season. He started out with some nerves, but has really shown leadership and confidence in recent games. A couple of his passes tonight had me jumping out of my seat, and I’m sitting at home watching on a 3 by 4 inch screen. I’m very happy that our team is in Doc’s hands for the next three and a half years. I also like that he has the 2nd or 3rd highest 3 point percentage on our team. That says a lot considering the fact that people said that he needed to be able to shoot the ball better to start the year. The kid can shoot the ball. He would be in the all-time single season Aggie leaderboard for 3-point percentage right now if he would have gotten more playing time to start the year. He only doesn’t qualify yet for lack of shots taken. Spencer Butterfield – I’ve loved this kid’s game ever since I saw the youtube vids of him playing in JC ball. He’s a perfect fit for the Aggies and Stew’s style of play. Hard nosed, tough player. Plays tough defense, and plays with some serious confidence out there. He hit a HUGE clutch three tonight to seal the victory for us on the road and has had several clutch plays this year. I figured he would start at some point along the way this year, and with Berger going down he has. I’m very glad we have him because I don’t think there is much of a drop off at all between him and Danny. Oh, and he’s shooting around 50% from the three point line so far this year if you need him, good enough for top 5 all-time in a single season. Kyisean Reed – The stat lines that he has been putting up this year are pretty unreal. He is getting more blocked shots per game than any player that we have seen since Nate Wickizer nearly twenty years ago. Not only that, he’s getting steals, assists, and thunderous face-melting dunks at an alarming rate as well. And shooting percentages? Well, he was in the TOP 4 ALL TIME in Career FG% going into tonight’s game where he shot 80% from the floor. I feel that Kyisean is underrated at this point. He is one of the better players we have had in a long time. He has been consistently good for us this year. 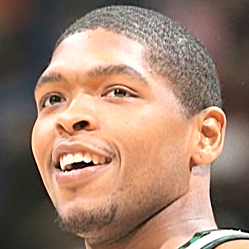 Jarred Shaw – A rebounding, scoring, and blocked shot machine. Shaw has put up comparable numbers to Kyisean in those three categories thus far this year and was, at least coming into tonight’s game, the leading scorer on our team. Big men that can shoot with the range and touch that he shows are few and far between. We’ve been lucky to have two of them in recent years (the other being Gary Wilkinson). While I would like to see him pass out of double and triple-teams a bit more often, I can’t really argue with his efficiency of putting the ball through the hoop. He’s one of the very few players we’ve had in the last 30-40 years that could actually average double-digit rebounds this year. I had faith that Brady Jardine would do it last year, and I think he might have had he not gone down to injury. Preston Medlin – After disappearing for a few games, Preston has shown why he was picked in the pre-season to be the WAC player of the year. He has the ability to take over games scoring the ball, and against Southern Illinois (and basically throughout the entire Gossner Classic event) even showed us a Morgan Grim-esque ability to draw charges at an incredibly high rate. Preston is the leader on this team and needs to play to his abilities and with the fire that we’ve seen from him if we want to do something special this year. And yes, this team can definitely do something special this year. A 10-1 record – Yes, ten wins and one loss. This team is winning over 90% of it’s games. No, we haven’t played Duke, North Carolina, Kentucky, and Kansas in our out of conference play, but with the slate that we were given we have won every single game except one against a very good St. Mary’s squad who has given us fits in the past, even in our “up” years. Listening to the call in shows and reading the message boards I sometimes feel that we have been spoiled in recent years. People saying we are a horrible team despite having a 10-1 record is just ludicrous in my book. People need to wake up and realize what we have this year. We have a very good team. We’ve seen two of our newly acquired prospects leave the team because they couldn’t cut it, and another starter collapse on the court in a near death encounter (some could argue he did die, and was subsequently revived). Despite all of that we are winning ball games. Is it pretty? No. Does it matter in the record books? No. Do you get style points for wins? No you do not. Get behind this team. Come out to the games. Cheer your guts out. Encourage the players on twitter and in the social media. Tell the nay-sayers they are wrong. Don’t let them be the loudest voices. Drown them out. This team needs you, and they deserve your support. We’ve heard from several actors in the Danny Berger story, none more important than Utah State Athletics Trainer Mike Williams. Mike had a chance to sit down with KSL’s Tom Kirkland for a segment on Sports Beat Sunday. Mike walks us through exactly what happened with Danny, and shows us the AED (Automated External Defibrillator) that saved Danny’s life. Check it out below. 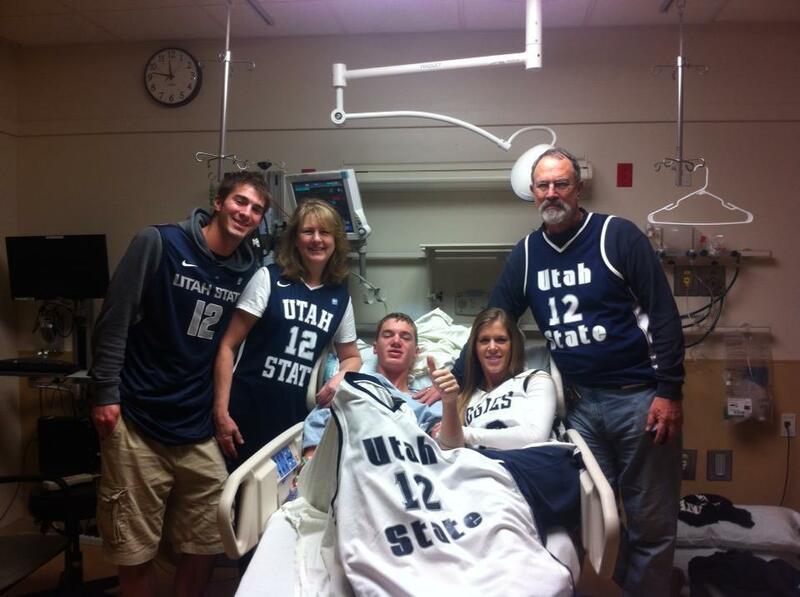 The last few days have been a roller coaster ride for Aggie Nation, and today I learned of a new twist in the miraculous story of Danny Berger. As you all know, on Tuesday while participating in practice before traveling down for the in-state clash with BYU, Utah State’s Danny Berger suddenly and unexpectedly collapsed. Berger, who showed no breathing, pulse, or other vital signs was immediately attended to by team trainer Mike Williams. CPR was administered but was not successful in restoring a pulse. Within the first two minutes, Mike Williams used an AED (Automated External Defibrillator) to shock Danny and help him regain a pulse and begin breathing again. Had that device not been available, Danny would most certainly not be with us today. Thanks to AGGIEFIGHT on USUFans.com I learned today that this device was donated to Utah State University by NBA player Ryan Gomes. Before Gomes made it to the NBA, he had an AAU teammate who passed away after collapsing in a pre game warmup session simply because an AED was not available to save him. Gomes teamed up with a charity known as Hoops for Heart Health with a goal of donating AED’s to schools and Rec centers around the country. Ryan, your efforts are definitely worthwhile. Danny is now alive and well. 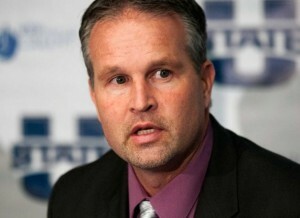 On behalf of USUStats.com and Aggie Nation, we thank you and Mike Williams for being heroes. Ryan provided the means, and Mike was there to administer the care that brought Danny back to life giving him a second chance. Thank God for them both. Danny Berger has been extremely efficient thus far and has taken care of the ball claiming an 8-to-1 Assist-To-Turnover Ratio, placing him #1 all-time in the category. Some may think that this is a fluke this early in the season, but remember that Danny led the team last year in Assist-To-Turnover Ratio with a 2.09 A/TO ratio. Spencer Butterfield has been deadly from downtown thus far, shooting over 57.1% from downtown. This is good enough to place him #1 all-time in Single Season 3pt FG%. Spencer also has a 2.0 A/TO Ratio placing him tied for 18th place with Justin Jones on the Single Season Assist-To-Turnover Ratio. Kyisean Reed also has claim to a #1 spot on a Single Season record, posting 2.0 Blocks Per Game thus far this season. Reed is also #8 on the Single Season FG% List, and #14 all-time in Career Blocks. Preston Medlin keeps adding to his legacy. Preston ranks 9th in Career 3pt FG Made and Career 3pt FG Attempted and 6th in Career 3pt FG%. Preston is also 11th all-time in Career FT%. As far as Single Season records go, Medlin is currently shooting .417 from downtown, good enough for 19th on the Single Season 3pt FG% list. He is yet another Aggie on the current squad to appear on the Assist-To-Turnover list with a 2.50 ratio thus far good enough for #6 all-time. Jarred Shaw is the first player in several decades to average double digit rebounds. He is currently 19th in Single Season Rebounds Per Game with 10.3 per game. Shaw is also 12th in Single Season FT% shooting over 85% thus far. TeNale Roland rounds out the list of Aggies in the record books thus far this year claiming the #23 spot in Single Season Assist-To-Turnover Ratio. Aggie Basketball GAMEDAY! Tickets only $5! It’s finally here! Aggie Basketball GAMEDAY! Tonight at the Spectrum we will get to catch our first glimpse of the 2012-13 Utah State Aggie Basketball team. Tonight’s game will not only be our first exhibition game, but will also act as somewhat of a replacement for the Blue/White Scrimmage event (modified Midnight Madness) that Stew Morrill has held each year since he has been a coach at Utah State. This year’s event was canceled, but to make up for it, tickets for tonight’s game are only FIVE BUCKS (or as always, FREE for students with Student ID)! Talk about a deal! Utah State basketball posters (and likely fridge magnet schedules) will be available at the game. Players will also be available after the contest for signing autographs. So shell out the five bucks (or get in free as a student), and get yourself and your family up to the Spectrum to kick off the 2012-13 season with a bang. Save time by getting your tickets online from the Utah State Ticket Office Website, or get them at the gate. Watch for large contributions from Marcel Davis, Spencer Butterfield, Jordan Stone and Ben Clifford. I’m also curious to see how well Riley Bradshaw has been learning both the PG and SG slots so far this year. Coach Morrill must have some serious trust in the kid to thrust him into learning two spots in our complex offense. In years past Stew has said that he does not ask this of newcomers for fear of overwhelming them. I think Riley will be up to the challenge. The season is quickly approaching us and my thoughts are turning more and more to this year’s upcoming squad. I think we are very, very deep this year. More deep than we’ve been for quite some time. I’m curious to see how Stew handles it. As we all know, he likes to get the rotation down to 8-9 guys by the end of the year. It’s going to be hard to do this year, in my opinion. I’m not sure what will happen at this position, but I thing both players are very strong. I expect to see Roland start to begin the year, but I wouldn’t be surprised if Doc took over as the year progresses. Either way I think we have a strong 1-2 punch. I’m not sure if either of these guys will immediately be as good as Brockeith was for us, but they will be close, and we will be deeper here than the last couple of years. For the past year or so I’ve been saying that Riley Bradshaw would come in and contribute right away and compete for minutes. It’s just hard for me to see how he will do that this coming year with the players that we brought in. Preston Medlin will command at least 32-35 minutes per game. I think he will be a strong candidate for WAC POY. Berger will clean up the minutes here and possibly play some SF as well. Spencer Butterfield will be a beast for us. I expect him to be All-WAC this year. Probably 2nd team. You heard it here first. He’s a flat out dead-eye shooter from downtown and with him and Medlin holding down the fort on the wings our opponents will really have to stay out on them, opening up the middle. We’ll have a built in zone-buster. Add to that his ability to drive to the hoop and apparent enjoyment of contact down low and you’ve got a good combination. I know very little about Marvin Jean except that our Staff really likes him and the players I have spoken with all said he’s a baller. I expect he’ll see some time, and Berger could command more minutes than I’m giving him if he performs. He’s the only other wing besides Medlin with experience here. Reed could command more minutes here, but I’m not sure how consistent he will be this year. He’s also been prone to fouling much like Tai was for us. If he can pull it all together for us and be as consistent on the road as he was at home he could be huge for us this coming year. An All-WAC type player. Sean Harris should see some time here for us if he can stay healthy. I’ve heard good things about him, and expect him to compete for minutes. I expect that either him or Clifford will see minutes at both post positions early in the year until Lopez is available. Ben Clifford will be solid for us as usual and clean up the extra minutes at this position. This position is very up in the air. I think Shaw will command minutes here based on his size and ability to score. Lopez will be ineligible to play until December and Harris or Clifford will likely have to fill in at this spot some. From what I have seen from Shaw he can flat out score, but seems to be in love with the mid-range jumper game. He’s a finesse type player and I haven’t seen him banging down low at all. In the ratball session that I watched he shot the ball about 9 out of 10 times it touched his hand, but probably made at least 75% of those shots, so I’m not sure I can blame him at all. I’m curious to see what Stew does with him. I don’t remember him being outstanding on the defensive end, but he has all the tools. I wonder how he will do against a big bruiser who loves contact down low. Matt Lopez is a very intriguing prospect as well. His game seems pretty raw at this point, but he has the physical abilities to be great. His defense looked good to me and his passing ability stood out. He made good passes in the correct situations out on the floor. He should develop well for us over the years. Jordan Stone: Jordan seems like the obvious candidate to redshirt down low for us. He could use the extra time to develop and polish his skills and he has the redshirt available. If Stew feels that we can hold down the fort until December when Lopez comes back I expect he might try this. It also depends on whether or not Harris can stay healthy. Riley Bradshaw: For the past year or so I’ve been predicting that Bradshaw will make an immediate impact on the squad and command minutes right from the get-go. I’ve backed off a little bit from that stance, and I think he might actually be a decent candidate to redshirt this year. Of course, I’m basing this off of one ratball session that I watched, so I may be way off, but with Butterfield, Medlin, Jean, and Berger, there seems to be some room for a redshirt for Riley. If he were to redshirt this year it would set him up to be a 2 or 3 year starter for us which I think would bode well for our future plans. If Stew decides to go this route, don’t be surprised to see his redshirt pulled mid-season if anyone gets injured. Quincy Bair: The plan for Bair has been to redshirt for quite some time now. The reviews of his game that I’m hearing are very mixed. I have yet to see him play in person, but it sounds like he has very good defense and the potential to be a very solid player in the future. He will need to work hard this season to develop his game to secure his spot on the team in the future. It will be nice to have another lock-down defender on the wings (of the Pooh / Newbold variety) come 2013-14. That’s all for now. Agree? Disagree? Hit us up with some comments on here! 1 – As has been proven over and over, ratball means pretty much nothing. Some players are ratball stars and never contribute when the real season starts. 3 – The stats that I kept track of are far from perfect. I realized that it’s pretty hard to keep all the statistics at once. Keeping track of scoring isn’t too bad, but keeping assists, rebounds, steals, and blocks at the same time makes it hard. I would give them about 80% accuracy. The scoring is fairly close (only missed a couple buckets) but the rebounds, steals, assists and blocks aren’t as close. I’m sure I missed several of them, but it should give you an overall feel. Went up to watch some ratball this afternoon and thoroughly enjoyed myself. The team looked very good offensively today. I’ll try to give a quick synopsis on each player that participated. Spencer Butterfield – Absolutely tore it up out there today. Dropped in 29 points. Hit 5 three pointers. I didn’t keep track of misses, but he didn’t miss many. I’d say he shot over 60% from downtown and I don’t remember him missing many two pointers. He got to the hoop with ease several times. Played with toughness and ran the floor. Played some solid defense. I was most impressed by him today. He also had 5 boards and 3 assists. Marcel Davis – Looked great out there today. I was most impressed with his shooting. He hit the majority of his shots and if we were playing NBA Jam we would’ve heard “He’s On Fire!” once or twice throughout the day. Seemed very comfortable distributing the ball. Ended up with 22 points (4 threes), 3 assists (this may be way off), three steals, and a blocked shot. TeNale Roland – Looked very comfortable and confident out there today. He’s very fast. Has a great handle on the ball and is more flashy than Davis. He hit a couple three pointers and ended up with 20 points. Has a very nice reverse layup that he uses when going full speed towards the hoop. Both him and Doc looked great out there today. I expect Roland to start at the beginning of the year mainly from how comfortable he looked out there running the team. To me it’s a toss up though. He also grabbed 4 boards, 1 assist (this may be way off), and 1 steal. Jarred Shaw – Shaw had a very good game shooting-wise. He dropped in 24 points on twelve made baskets. He did not show a power game, but more of a finesse game. He has a little jab step pull up jumper that is pretty effective from 8-14 feet out. He hit the majority of the shots that he took. When the ball goes to him he rarely gives it up. Looks to score, possibly to a fault. I can’t blame him too much today though because the shots were falling. Teams will have to guard him close to prevent him from getting his jump shot off. Had 4 rebounds, 0 assists, and a block. Jordan Stone – Stone had some nice moves under the hoop. All of his shots were within 5 feet of the basket on power moves. He had 14 points. Got several offensive rebounds and picked up at least 1 steal. Didn’t have any assists that I saw. He appears to be the strongest of our bigs and likes to bang down low the most. Matt Lopez – The thing that stood out to me is his basketball IQ and passing ability. He had some very nice passes out of the post for easy baskets. Ended up with 4 points, 5 rebounds, 3 assists, and a block. His post moves need some polishing, but he has the body for it. Didn’t put up a ton of shots. Played solid defense. Appears to have a “power game” but not so much as Stone. Preston Medlin – Preston wasn’t looking for his shot as much as he normally does, but was getting others involved. He looks very comfortable out there. Had 15 points (1 three), 2 boards, 2 assists, and a steal. Scored on Bradshaw once with a nice post up. Backed him under and got an easy hoop. Appears to be a good leader out there. Danny Berger – Berger was shooting well today. Had 15 points (3 threes), 6 rebounds, and 2 assists. Most of his shots were three pointers. Looked pretty solid. Kyisean Reed – Had a very nice rebound putback dunk (surprise!). Didn’t seem to be quite as assertive as he could have been. Had 14 points, 6 boards, and a steal. Seemed to be trying to develop an outside shot a little bit more. Hit a couple of them but missed several as well. From another report I heard that he was head and shoulders above all the other players, but today he wasn’t. Hopefully he can develop consistency. Has a nice beard and mo hawk ‘do. Ben Clifford – Played well. Ended up with 10 points, 4 boards, 1 assist, and 1 steal. Didn’t back down on either end of the floor. Was just solid out there. Hustled well. Brockeith Pane – Scored 8 points (0 threes). Had 1 rebound, 1 assist and 1 steal. Seemed to be out there in more of a mentor role. Stuck up for Butterfield from the bench on one play where the other team was trying to call a traveling violation on a Butterfield fast break layup. Also has a nice beard and mo hawk ‘do. Played the SG position most of the time to allow for Roland and Doc to play the point. Did play some point along the way. Sean Harris – DNP. He was there in basketball shorts and a nice pink Aggie shirt. 🙂 He’s a pretty big kid. He took shots at times while the teams were on the other side of the court. After the scrimmages he went out and did a little running and put up some shots. He is very adept at hitting the three point shot (at least in practice). He was hitting them with consistency. Appears to be a good FT shooter as well. Quincy Bair – DNP. Was not present due to recent surgery (appendix). Marvin Jean – DNP. Was not present (recent surgery on thumb). Quinn Taylor – DNP. Was not present. I spoke with Doc and Riley after the scrimmage. They said that Harris is out for precautionary reasons. He is cleared to play starting in August. They both said that Marvin Jean looked really good and was playing well for them before the injury. They said he should be back in 3-4 weeks. They said Quincy would be fine as well. Doc is one of the most polite, nicest kids I’ve seen. Riley was very cool too. I’m proud to have them on the team. Congratulations to Brady Jardine for being named to the National Association of Basketball Coaches (NABC) Honors Court yesterday. 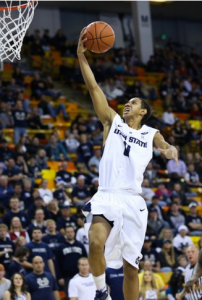 The athletic forward for Utah State was selected for his academic achievements off the court during the 2010-11 season. Brady is the only player from the State of Utah to be honored with the award. Brady’s academic prowess (3.71 cumulative GPA in Finance) has also helped him be an Academic All-WAC recipient three times, as well as being named to the College Sports Information Directors of America Academic All District first team in 2011. For more information read the official announcement at Utah State’s Website.